On the way home after buying our new bed, Morah and I stopped at Bed Bath & Beyond to buy king-sized sheets. We had already discussed what we wanted, and on an earlier trip, Morah had scoped them out. The sheets we bought are made from bamboo fibers. Fabric made from bamboo is fantastic because bamboo is a highly-renewable resource, because it has naturally antimicrobial properties. Add to that the fact the dust mites have a hard time living in the latex mattress, and our bed is suddenly one of the cleanest places in the house. Whenever we tell someone we have bamboo sheets, their first response is usually, “bamboo? That doesn’t seem very soft.” Folks, I’m here to tell you that these are the softest sheets between which I have ever slept. Sliding into bed the first night was a life-changing experience, and now that I know awesome bamboo fabric is, I want more things made from it. Actually, I already have a bamboo shirt that I bought a few months ago from a local fair-trade store called Kizuri. The shirt is wonderfully soft. I’m definitely going to buy a few more. Bamboo? That doesn’t seem very soft. I got Brent cotton and bamboo blend socks and he loves them. 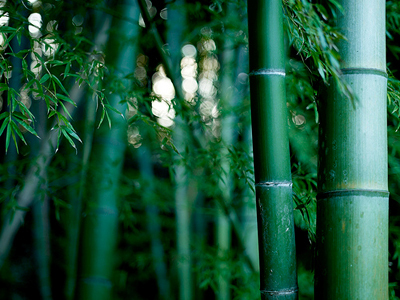 Bamboo can stay. It’s weird, but it can stay.